Evil is not just an esoteric concept. Evil is very very real. I have seen Satan’s work in conflict zones, all over the world, with my own eyes. There is a war between good and evil taking place right now, in our country, and in “our” state! Socialism and Communism are solely responsible for more death and destruction in the last century than any other single cause. Yes, it’s true that legitimate governments killing their own citizens either by starvation or other means was one of, if not the leading cause of death in the twentieth century. Do you think we are above that? Well perhaps for now, but is that good enough? It is true that we have no Joe Stalin, Castro, Mao in this country today, but their disciples and students are alive and well. To make matters worse....some of them are currently educating your children in our nations Universities. The result of our indifference to the indoctrination of our children is plain for anyone with eyes to see and ears to hear. There is less civil discourse in this State and in our nation than I can ever remember, at least since Bill Ayers, Bernadine Dorn, Angela Davis and their ilk, learned their trade, bombing police stations and taking over buildings in the 1960s and 70s. Prior to becoming University professors, that is. Evil, has a plan, I believe. The overthrow of the Constitutional Republic of the United States of America. States like California are already lost. That is why it is so vital that we win! That is why it is vital that we form the 51st state, Jefferson. We must not weaken! The first Article 4, Section 3 State formation in 150 years! Constitutional Republic with districts small enough that your legislator will be afraid of his or her constituents. Districts small enough that it would be cheap and easy to get rid of a crook or a bum should we accidentally elect one. We could drain the money swamp from state politics. Districts small enough that we would have citizen statesmen. Thomas Paine said that the numbers of representatives should grow as the size of the colonies grow, in order that no legislator is ever far enough removed so as to form a separate agenda from his constituents. What a concept! Imagine a state where the inalienable rights to Life, Liberty, Property, and Defense of self, family, community, and State are cast in granite never to be altered by future courts or legislatures. Imagine a place where inalienable rights are legally and Constitutionally placed out of the reach of power hungry politicians. From our state, Jefferson, we the people, would have a national platform from which to begin the long and arduous task of helping to restore our Republic. Even though we may now have a friendly administration in Washington, there is no guarantee we will have one in the future. Our freedom and that of our children is in our own hands. Liberty is ours to win or ours to lose! We must have our own state. States are the authors who formed the Constitution. States are the entities tasked to oversee our founding documents. A state where the Liberty of its citizens is unassailable is our only long term defense against tyranny. Remember ladies and gentlemen. The Constitution was never meant to stand between you and the evil of this world, and believe me when I tell you that evil is ever present. Here is the good news! We can do it. All just power is derived from the people. Read your Declaration of Independence. All we need do is use the power given us by Almighty God and demand the Liberty placed in our hearts at the moment of our creation.....barring that, we have the God Given Right to alter or reform an unjust government any time the public good requires, (Cal Const A2, Sec 1). Please help us do this. We have a better chance to succeed if our numbers are great. Jefferson is only a dream if we fail to act. Twenty three counties have had enough of the oligarchs and tyrants in Sacramento. 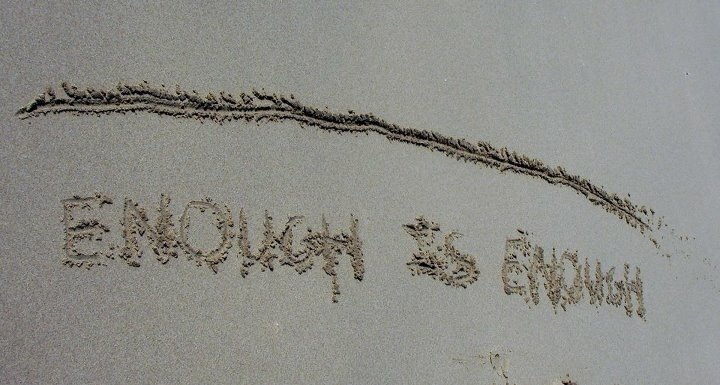 Won’t you cross that line in the sand and count yourselves among us? 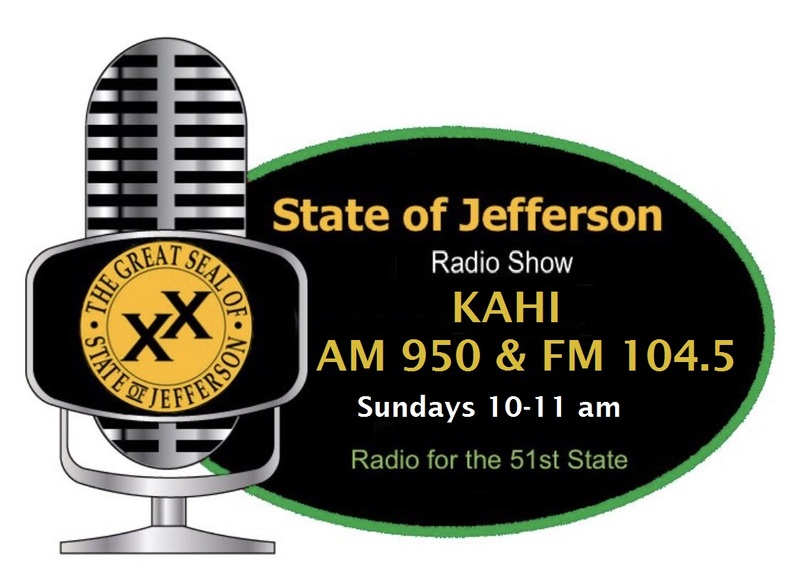 Visit www.soj51.org. Contribute to our case if you can. If you cannot, volunteers are always welcome. Contact your county committee, ask to help. John Adams said, “Liberty must be protected at all hazard, you have a right to it derived from your maker. Even if this were not true....it was purchased and bought for you by your fathers with their ease, their estates, their blood and their treasure”. John Adams went on to ask us, to hope, that we not squander the Liberty so dearly purchased through hazard and blood lest he, from heaven should see and be heartbroken at its demise. We cannot do this alone. We of the Jefferson Declaration Committees of twenty three counties need your help. Liberty first, Liberty always, because without Liberty, government, either by deception or force, will take from you, all of the rest. Don't forget, Jeanette Finicum, widow of LaVoy Finicum, will be at the Shasta County Patriots meeting on Monday, September 10th. 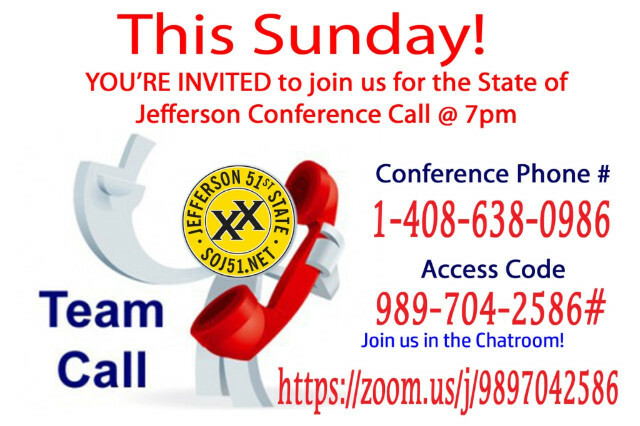 The Jefferson meeting starts at 5:30pm and the Patriots meeting begins at 6pm located at 2570 S Bonnyview Rd in Redding. Join us at the second annual Harvest Festival on October 6, at the Anderson River Park Amphitheater located at 2800 Rupert Rd, Anderson CA. Admission is free. This family-friendly, fun event is from Noon until 8PM. There will be four bands, beer, food, pumpkin painting, crafts, laser tag, vendors and various non-profits. Don't forget to bring your own chairs. We will also be selling raffle tickets for a Glock. You can choose your own size and caliber if you are the lucky winner. Tickets are $5 each or 6 tickets for $20. Must meet DOJ eligibility requirements. Hurry and get your tickets because they go fast! Contact Britt at 530-339-6286 or email her at b.cournyer@frontier.net for information regarding this event.